My sister Molly is a budding chef. She usually makes desserts for family gatherings; they are always fantastic! There must be a pizza-loving gene in our DNA because she loves pizza almost as much as I do. We spent the afternoon together and we ended up making pizza. I’m turning over the computer to her to blog about her pizza. 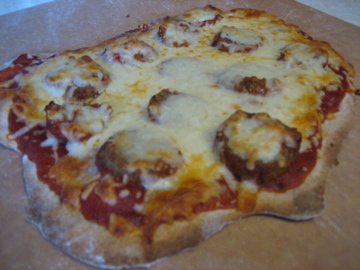 The pizza Suz and I made is a meatball pizza. I love meatballs just like I love pizza, so why not combine them? The trick is to sprinkle cheese on the pizza after you put the meatballs on. (To make the meat balls extra cheesy!) When I took my first bite, I was amazed at how good the pizza was! The perfect balance of cheese, meatballs, and sauce! Three words: Best. Pizza. Ever. This entry was posted in cheese, marinara, meat, meatball, mozzarella, sauce and tagged cheese, meatballs, pizza. Bookmark the permalink.